This Periodic Table wallpaper HD shows the densities of the elements. Each element is represented by its atomic number, element symbol, element name, atomic mass and density. The density values are taken at or around room temperature. If an element has multiple allotropes, the density value is for the allotrope listed above the density. Some element densities are for their diatomic forms. The width of the background color for each element is relative to the density of the densest element, osmium. 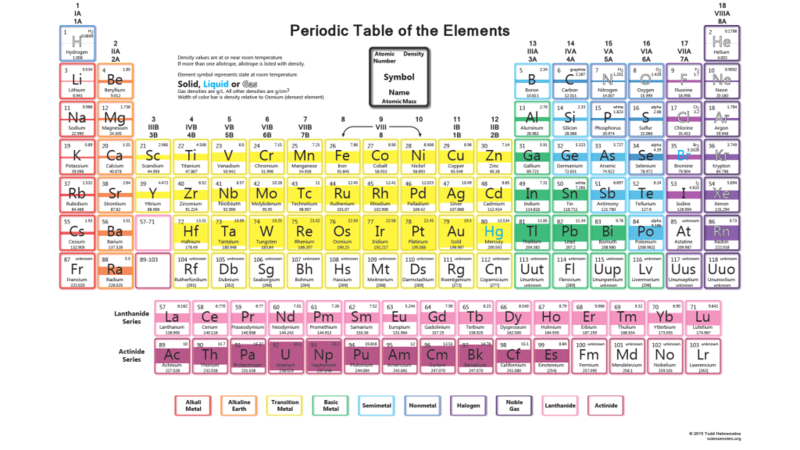 This periodic table wallpaper HD is suitable for high definition, widescreen devices. If you’d like to print this table, there is a PDF version of this table. To print, choose “Fit” and “Landscape” as your print options for best results. Reference the density periodic table, the gas densities should be g/l. This is not indicated on the table. Great chart otherwise. Thanks for pointing this out. Table has been modified to reflect this change.